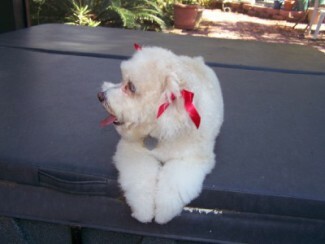 Cockapoos come in many colors: Sable, Phantom, Roan, Parti color, Buff, Black, Chocolate, Red, Apricot, Cream and White. You can find many variations of shades and mixes of colors. Cockapoos have the potential for a wide range of colors depending on the parents and their backgrounds. We have provide a list of colors and description and have also provide pictures so you can see what each color looks like. 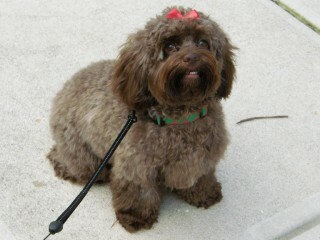 Sable Cockapoo : The base coat is dark chocolate, black or red with tipping and shading in black or another color. 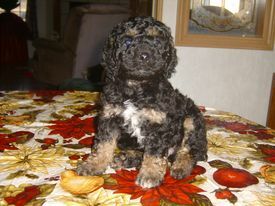 Phantom Cockapoo : Black or brown with markings in white, silver, tan, red or brown; the markings are spots over eyes, on the sides of the cheeks, symmetrical spots on chest, under tail, inside ears and on lower legs. 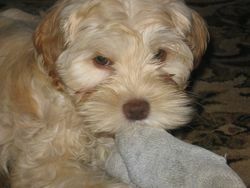 Roan Cockapoo : A white base coat with many freckles and spots (rather than patches) to the point where the white is barely seen. 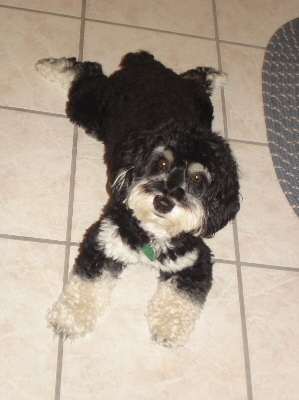 Parti Color Cockapoo : Any coat color showing in patches on white. Developing spots,freckles, on muzzle and legs. Ears are usually colored. 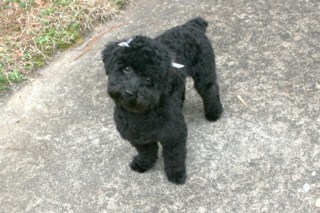 Buff Cockapoo : Is the most popular and most common color. Buff is referred to these colors Light cream, honey, Champagne, golden, tan, beige, auburn and any shade of tan. 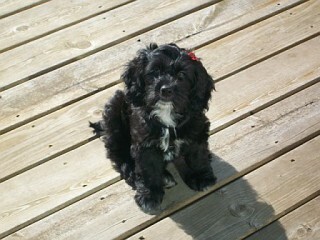 Black and White Cockapoo : Black with white markings on face, chest, tummy or paws. 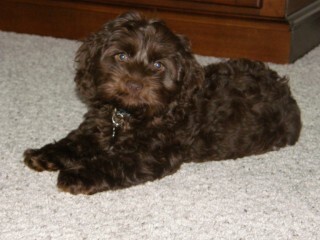 Chocolate Cockapoo : Can vary from light to dark brown like a Hershey bar. Red Cockapoo : Red tint to a full deep Irish setter red rust tone. 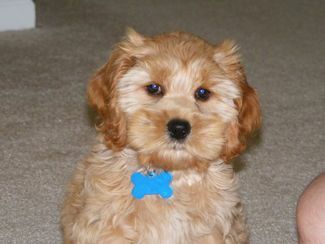 Apricot Cockapoo : Is similar to cream but the highlights will have definite reddish cast. Red and Apricot: Cocker Spaniels are referred to as reds and Poodles are referred to as Apricot. 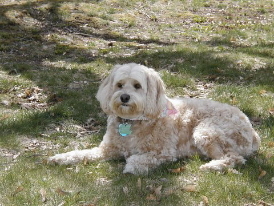 Cream Cockapoo : Is basically a light color close to white but with cream highlights on ears and back. 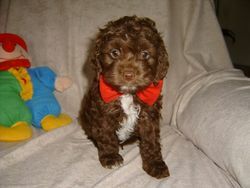 We have provide information on our site about cockapoo colors, we have Cockapoo puppies for sale in a variety of colors Black cockapoos, chocolate cockapoos, brown cockapoos, red cockapoos, buff cockapoos, apricot cockapoos, black and white cockapoos, parti-color cockapoos, phantom cockapoos and sable cockapoos, cockapoo, Cockapoo puppies, cockapoos for sale, cockapoo puppies for sale, toy cockapoos, miniature cockapoos, cockapoo breeders, cockapoo sizes, cockapoo waiting list procedures, shipping and delivery your cockapoo puppy, cockapoo puppy supplies that you will need for your new puppy, how to train and care for your new cockapoo puppy, testimonies and comments from our happy cockapoo families and frequently asked questions and common concerns about cockapoos. 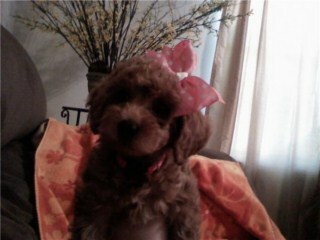 We have sold Cockapoo puppies in Georgia, Atlanta Georgia, Macon Georgia, Florida, California, Texas, Alabama, Arizona, Arkansas, Colorado, Connecticut, Mississippi, South Carolina, North Carolina, Missouri and Tennessee.